Sri Krishna arrived in the Hastinapur court as messenger of peace and it is an important incident in the Mahabharata. After their exile period got over, Pandavas were now without a kingdom, they made serious efforts to strike peace with the Kauravas. As part of peace efforts, Krishna was sent as the messenger to the Kuru court at Hastinapur to make Duryodhana understand the importance of peace. Krishna was Shantidoot – the messenger of peace. When Krishna enters the Hastinapur palace court, Duryodhana is in consultation with Shakuni, Karna, and Dushasana as to who will lead the Kaurava army against the Pandavas. When the doorkeeper announces the arrival of Sri Krishna, he orders the members of his court not to give him a standing ovation. But such was the impact of the personality of Bhagavan Sri Krishna that contrary to Duryodhana’s order everybody in the Hastinapura court stood up. As Shanti Duta, Krishna pleads for peace. He requests Duryodhana to reconsider his decision of not returning Indraprastha to Pandavas. When the elder Kaurava prince did not agree to it, Krishna asked the Pandavas be given five villages. When Duryodhana declined, Sri Krishna asked for a single village for the Pandavas. Proud, arrogant and haughty Duryodhana told Sri Krishna that he would not give land equal to a point of a needle to Pandavas. The peaceful talk broke down and verbal sparks started flying. An angry Duryodhana ordered his soldiers to arrest Krishna and tie him up. An angry Krishna now assumes the Vishwarupa, the all-pervading terrible form. Duryodhana now sees Krishna everywhere and nowhere. Duryodhana was on his knees with his head buried in his arms, as he was unable to witness the universal form. In his universal form, all human beings, plants, animals, the entire creation, stars, planets, all imaginable and unimaginable are found within Lord Krishna. Then, Krishna began to shine like lightning, those present in Hastinapura court could not bear the effulgence of him. 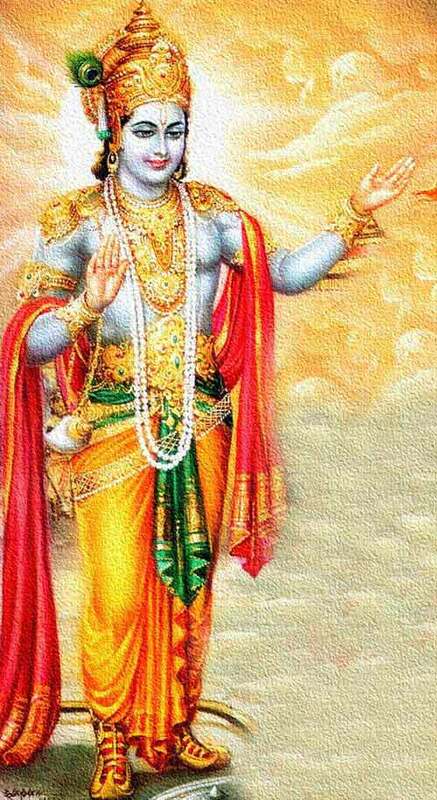 The cosmic form of Krishna was unbearable to those who practiced Adharma. With the grace of Krishna; Bhishma, Drona, Vidura and other rishis in the court was able to have a glimpse of the spectacle of spectacles. Mother Earth was happy that she was holding the Vishwaroopa but Krishna’s cosmic form had now become unbearable for Mother Earth. Earthquakes and tempests began on all corners of the earth. Seas began to boil. People thought the world was coming to an end. All birds on earth were in the sky. Wild animals ran in a frenzy. Krishna then reverted to his human form to avoid the apocalypse. As his attempts to bring peace failed, Krishna walked out of the Hastinapur palace.